Do You Need to Expand Your Jaw? Why Not Do It Without Surgery? We’re guessing that you’ve been told you need jaw surgery. How’d we know? Well, it’s because we have a lot of patients who come to us who’d also like to avoid surgery. And when someone tells you that you’ll need a major operation just to be able to live and feel good, it’s natural to see if there’s a less invasive option out there (thank you, Internet). Ready for the good news? There is a surgery-free option! The even better news is we offer it right here at Exceptional Dentistry in Palmdale, CA. Thanks to the advanced training that Dr. Powell has, he’s able to eliminate breathing problems, severe TMD, and even improve facial structure without you needing painful surgeries. We’re able to offer a couple different options for you, depending on your specific needs, but it’s likely that you’d benefit from treatment involving FAGGA. We’re betting dollars to donuts you haven’t heard of the acronym FAGGA when it comes to correcting a misaligned jaw and a bad bite. It’s a dental term that stands for Fixed Anterior Growth Guidance Appliance worn by adults to expand their dental arches (aka the crescent arrangements of teeth). You might also hear it referred to as AGGA. Or even RAGGA which stands for Removable Anterior Growth Guidance Appliance and is typically used for children who are still developing their adult teeth. 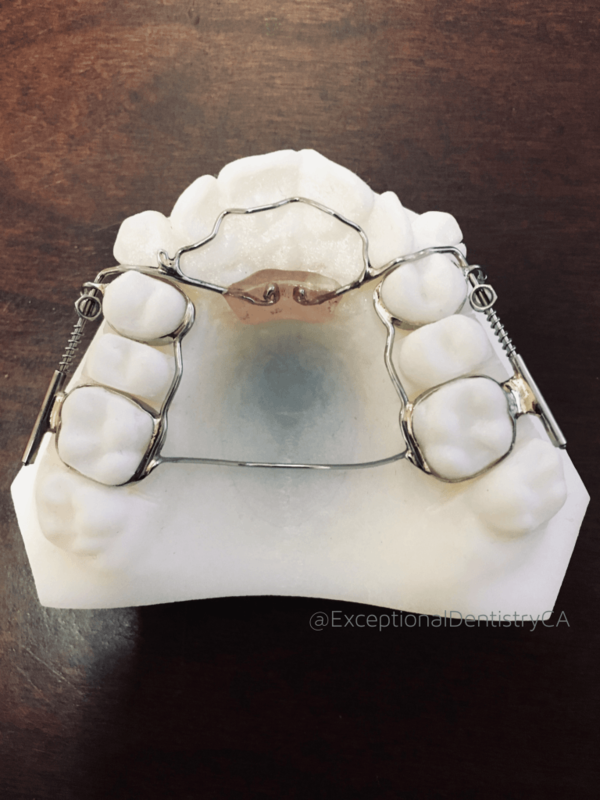 While the device might look pretty similar to a wired retainer, it actually expands the upper arch and has been described as a bone growth appliance. The device is fixed to your back teeth (which means you can’t remove it for the duration of the treatment—much like braces) and it stimulates your DNA to create bone growth. What this means is the appliance gently and safely expands the upper jaw which will allow the lower jaw to follow suit. This maxillary expansion of the jaw or jawbone is not only done to make room for the crowded teeth in your bite but it also creates more tongue space, opens your airway, and moves your face in a forward direction (which makes your cheekbones, eyes, nose, and lower jaw look more aligned) to give you a more symmetrical profile. Improving Breathing is Good for Everyone, So It’s Good for You Too! In addition to the FAGGA, Dr. Powell typically recommends myofunctional therapy to also be utilized. Myofunctional therapy helps improve the functionality of the muscles in the face, mouth, and throat. Everyone can benefit from improved nasal breathing, and by taking a multidisciplinary approach we can improve your quality of life. When it comes to the bones in your body, the upper arch is one of the most important because it decides the position of your lower jaw. Your lower jaw affects your TMJ joints as well as your airway. And if you need help realigning your jaw, a FAGGA appliance can do the job effectively. And it does it without jaw surgery! Wearing the FAGGA also helps resolve your TMD symptoms and improves your facial profile while straightening your teeth. How Much Time Does It Take to Work Its Magic? There’s two phases which will guide the teeth and muscles into their optimum positions. Phase one is where you wear the FAGGA for approximately 7 months and during this time the arches and airway are being expanded. Once phase one is complete then you would move to phase two in which you’d wear controlled arch braces to move the teeth into the optimum position for approximately 18 months. So in general, the process takes 14-25 months depending on the individual’s needs. Who Can Benefit from an Anterior Growth Guidance Appliance? Do You Need The Growth Guidance Appliance? In the past, occlusal theories focused on the hard tissue structures in the body but still didn’t take into account a comprehensive view that could allow predictable outcomes. With physiologic dentistry, we factor in a total system evaluation because the body functions as a biologic being. Since the body is connected to one’s oral health, we analyze the soft tissues along with the entire system – including musculature, bone and teeth – to create a stable result from several perspectives, such as the posture of the head, neck, body, and jaws, and how they interrelate. In fact, the bite affects the rest of the body from the top down. Taking into account the muscular balance also allows us to develop a better occlusal stability and long-term restorative or orthodontic/orthopedic stability. To help you figure out if you might benefit from the FAGGA, our exceptional dentist, Dr. James Powell, will have you take digital X-rays and pictures to create a study model. Using the pictures, he’ll evaluate your upper jaw and your profile and will determine if your midface is deficient. FAGGA is also an effective, conservative treatment alternative to surgery if you suffer from the effects of sleep apnea or severe TMJ pain TMD/TMJ treatment and headaches, or have an underdeveloped jaw which affects your airway and causes breathing issues. And there you have it! The FAGGA is a painless, non-surgical way for you to avoid jaw surgery and finally get the relief from TMJ pain, sleep apnea, or a poor bite while improving the overall symmetry of your facial structure. We’re here to help, so call us to schedule an exam with Dr. Powell so that you can find out if the FAGGA is right for you. Simply reach out to our Exceptional Dentistry team by calling (661) 349-7725 and speak to a member of our caring staff. You can also schedule your reservation online. With the help of a growth guidance appliance, you can improve the quality of your life.